Thomas Paine wrote those words in 1776. Found in his spectacularly successful pamphlet Common Sense, they capture what many American revolutionaries hoped would define their new nation. Paine and others hoped that in this new land of liberty even the most powerful would have as much to fear from breaking the law as did the average man. This hope for a republic ruled by laws instead of men was expressed in the constitutional order they created: the fundamental innovation of a written constitution is the idea that even legislatures and presidents should be bound by a higher law. Though the roots of "the rule of law" run deep in American thought, it is an ideal Americans have often fallen far short of. From the very beginning American society has seen many of its citizens break the law, get away with it, and at times even be celebrated for doing so. However, both the laws which were broken and those who were allowed to break them have varied greatly one generation to another. Understanding who feared the law and who flouted it is essential to understanding who has held the seat of power across America's history. Those who refused to comply with the Federal Militia Act of 1792 fit the pattern that matches most of those who broke the law during antebellum times. They were not the rich, powerful, or well connected, but ordinary folk living in scattered agricultural communities across the United States. When they defied the law or acted outside its bounds, they usually did so as a community. Politicians who tried to impose laws against the popular will of these communities could not stay in office. "In America, the means available to the authorities to uncover crime and to arrest criminals are small in number. There is no administrative police force; passports are unknown. The United States criminal police force cannot be compared with ours in France.... However, I doubt whether crime evades punishment less often in any other country. The reason for this is that everyone feels involved in providing evidence of the offense and in apprehending the offender. Tocqueville describes this vigilantism in a positive light, but it had a sinister side. Often criminals these vigilantes caught were killed without due process. More ominous was the tendency of vigilantism to escalate into full blown mobbery, with communities tarring, burning, and killing minority groups like Mormons or free blacks. (Occasionally mobs formed for more benign purposes, such as those formed in New York to protect runaway slaves from federal agents). In most cases, authorities were helpless to stop these mobs. Often they joined them. 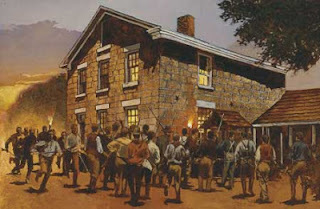 A mob gathers to kill Joseph Smith, Mormon prophet. Hurlbert [the District Attorney] said Erzinger is willing to take responsibility and pay restitution. It seems that our financial elite are not only too big to fail; they are too big to jail. The contrast between the America of the 1830s and the America of the 2010s is instructive. Both display a contempt for the rule of law. In both eras those who wielded power were able to escape the law's "long" reach. In both eras those with greatest influence in the crafting of laws did not feel bound by them. What made the two eras so different is who those people were. In 21st century America the people are not equal before the law. This inequality is one clearest indications that America has separated into two distinct political classes - one that rules and one that is ruled. There was once a time where the American people could really say that theirs was the seat of power. The same cannot be said today. Thomas Paine. Thomas Paine: The Rights of Man, Common Sense, and Other Political Writings. ed. Mark Philip. (Oxford: Oxford University Press). 1995. p. 35. The full citations are: Daniel Walker Howe. What God Hath Wrought: The Transformation of America, 1815-148. (New York: Oxford University Press). 2007. pp. 411-446 and Lawrence Kohl. Politics of Individualism: Parties and American Character in the Jacksonian America. (New York: Oxford University Press). 1989. pp. 145-177. Howe, What God Hath Wrought, p. 492. Alexis de Tocqueville. Democracy in America. trans. Gerald Bevan. (New York: Penguins Book). 2003. p. 113. Howe, What God Hath Wrought, p. 435. [By way of example,] should an obstacle appear on the public highway and the passage of traffic is halted, neighbors at once form a group to consider the matter; from this improvised assembly an executive authority appears to remedy the inconvenience before anyone has thought of the possibility of some other authority already in existence before the one they have just formed." Alexis de Tocqueville, Democracy in America, p. 220. Glenn Greenwald. With Liberty and Justice for Some: How The Law is Used to Destroy Equality and Protect the Powerful. (New York: Metropolitan Books). 2011. pp. 101-103; quotation is from Randy Wireck, "Alleged Hit-and-Run May Not Face Felony." Vail Daily. 4 November 2010. After receiving more than 1,000 letters in protest, the district attorney published a more elaborate defense of this decision. "Vail Valley Voices: DA Explains Controversial Bargain Plea." Vail Daily. 9 November 2010. Both quotes are found in Peter Finn and Sari Horwitz. "Justice Department Outlines HSBC Transactions With Drug Traffickers." Washington Post. 11 December 2012. Nils Pratley. "What Does it Take For a Bank to Get Prosecuted?" The Guardian. 11 December 2012; Nils Patley. "HSBC: Banking to a Different Set of Rules Reaps Dividends and Stability." The Guardian. 4 March 2013. Peter Finn, "Justice Department Outlines." BBC News In Depth: World Prison Populations.